After the tragic death of her parents, Iris (Brittany Snow) is desperate to make ends meet. When seemingly philanthropic aristocrat Shepard Lambrick (Jeffrey Combs) expresses an interest in helping them by inviting her to an exclusive dinner party that offers the chance at untold riches, Iris finds herself in a group of similarly desperate individuals all looking to make some easy money. But the guests soon find themselves trapped in Lambrick's mansion and forced to play a sadistic game of Would You Rather, where only the winner will get out alive. A 2012 movie called Would You Rather takes this conceit to a horrific extreme. After the death of her parents, Iris (Brittany Snow) finds herself responsible for the care of her terminally sick brother Raleigh (Logan Miller). She lacks the financial wherewithal to do much for him and they struggle to make ends meet. In the face of this, Iris receives an offer from philanthropist Shepard Lambrick (Jeffrey Combs). He plans to throw a dinner party that will culminate in a contest among the guests. The winner will get whatever they need to prosper. After some thought, Iris agrees, as she feels this may be the only way to get Raleigh the bone marrow transplant he requires, especially since Lambrick promises that if she wins, he’ll immediately find a donor. At the dinner, Iris learns that she’ll play a game of “Would You Rather?” that requires some horrifying choices – and results. I never watched any of the Saw movies, but from what I know, they seem to come with similar situations. Those place characters in “no-win” situations that force them to perform grotesque actions if they want to survive/prosper. That doesn’t make Rather a knock-off, though, and I like the way it twists the old game. 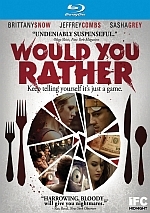 Like I mentioned at the start, everyone plays “would you rather?” with friends, so it’s a natural subject for a movie. One could take the premise for comedy or horror, but it’s still a worthwhile conceit. Does Rather exploit it well? To a reasonable degree, I would say it does. While the film never turns into anything great, it manages to deliver an unnerving experience. Happily, it largely avoids graphic images. Going into the film, I worried that it would rely on disturbing visuals to create its impact, as that’s often true in this genre; filmmakers frequently substitute unpleasant shots for actual tension or drama. That doesn’t occur here; while not free from blood, the movie fails to show anything genuinely gross, even when the opportunity arises. That means Rather depends mostly on the psychological drama, and it develops fairly well in that regard. It sets up a creepy feel from the start and can make mundane actions such as the consumption of a steak by a vegetarian character seem repulsive. The film comes with a sadistic streak that makes it compelling and appalling at the same time. Rather also avoids absurd extremes. When placed in the titular game, the characters select from choices that don’t become ridiculous. Sure, they’re unpleasant – and potentially deadly – but they don’t go down nutty paths. The options make sense and allow us to buy into the dilemmas faced by the characters. Some may dislike that Rather gives us little backstory for any of the roles other than Iris; we get quick overviews of the “players” but not much more. I have no problem with this; after all, Iris is the lead, and if we spent lots of time with the background of the others, the movie would really sag. We want to concentrate on the game itself and not be stuck with tons of exposition, so the choice to avoid much info about most of the characters makes sense. The actors do fine in their roles. Combs tends to feel a little campy as Lambrick, but this makes some sense; after all, someone with such a sadistic streak would have to be a bit loopy, so Combs’ decision to play him in a theatrical manner works. The other performers don’t dazzle but they’re perfectly competent. Really, the biggest problem I find here comes from the movie’s twist ending. I don’t want to reveal what happens, of course, but I don’t think it works. Finding a satisfying conclusion to such a dark tale would be tough, but I think the filmmakers could’ve done better. That misstep aside, Would You Rather presents a mostly effective horror-drama. It takes a clever conceit and plays with it in a positive manner to turn into a dark, disturbing narrative. Would You Rather appears in an aspect ratio of approximately 2.40:1 on this Blu-Ray Disc. This was a decent but unexceptional image. Sharpness looked adequate. At times the movie could be a bit soft, which seemed to stem from the interior settings and the digital cameras. Nonetheless, overall definition seemed pretty good. No concerns with jagged edges or shimmering occurred, and edge haloes were absent. No print concerns appeared in this clean presentation. Colors were fine. The movie tended toward a subdued palette that was more than adequate. It veered green-brown much of the time to fit the movie’s sickly feel, and the tones worked.. Blacks were fairly dark and tight, and shadows showed good clarity. Sharpness was the main concern here; while not a big issue, the mild lack of definition was enough to make this a “B-“ presentation. Among the set’s extras, we find an audio commentary from director David Guy Levy and writer Steffen Schlachtenhaufen. Both sit together to discuss story/character areas, cast and performances, sets and locations, various effects, music and editing, and related subjects. Every once in a while, Levy and Schlachtenhaufen throw out good info, and on occasion, they almost start to get up a head of steam. That meant I encountered moments in which I thought this would become a worthwhile commentary. Alas, these trends never lasted. As soon as Levy and Schlactenhaufen would seem to get into a groove, they’d fade. I found tons of dead air here, and even when they spoke, much of the material tended toward praise for folks involved. While I did learn a bit about the movie, the package frustrated me too much to be a worthwhile expenditure of time. The disc opens with ads for The Jeffrey Dahmer Files, On the Road, Antiviral and My Amityville Horror. 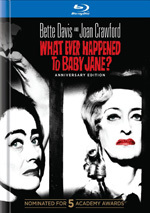 The disc also presents the film’s trailer and a poster gallery. In the latter we see 14 advertising images. Though some are similar, we still get a good feel for the promotional concepts explored for the movie. With Would You Rather, we get a disturbing take on an old children’s game. The movie uses its concept to its advantage and provides an unnerving experience. The Blu-ray delivers reasonably good picture and audio along with a disappointing audio commentary. While I don’t think the disc dazzles, the film itself creates an involving piece of work.